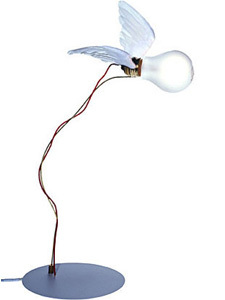 Ingo Maurer Replacement Light Bulb for Lucellino Lamps. 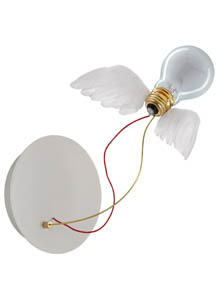 Hard to find Ingo Maurer replacement light bulb. This is the 35W low voltage light bulb for Ingo Maurer Lucellino Lamps. This light bulb is an authentic Ingo Maurer replacement bulb. Use only for the Lucellino Table Lamp and Lucellino Wall Lamp. Authentic Ingo Maurer product suitable for Ingo Maurer's Lucellino Lamps. Price is for 1 (one) light bulb. Price includes complimentary shipping within the US. Please make sure to order either the wall or table edition. Both look similar but have different cables. Special halogen bulb, each 35W, produced exclusively for Ingo Maurer GmbH, only for use in the Lucellino product family. Luminous flux: 1200 lumens, light efficiency: 10 lm/W, output: 120 kW/1000 Std. Mean life: 2000 h. EU energy class: approx. C. Socket E27.